What, you thought I’d just go with “It’s a trap!”? That’d just be lazy. (Also, repetitive.) 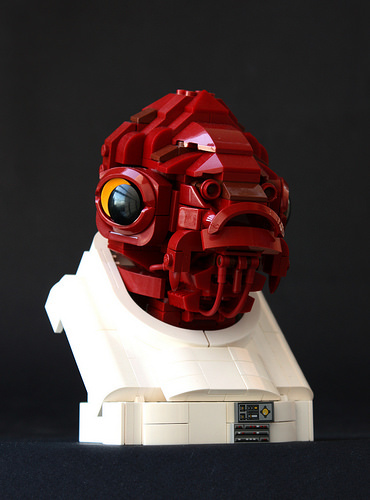 Admiral Ackbar may not have had the most memorable line in The Force Awakens, but his presence at the Resistance base marked another point in the movie that reminded us we were watching a true Star Wars film again. Master character builder Eero Okkonen captures the essence of the Mon Calamari admiral with a variety of slopes, vehicle fenders, reins, and other sundry bits. A few pieces of brown lend subtle texture to what would otherwise be a mass of dark red. His expressive eyes are built from a black 2×2 boat stud layered over a round 2×2 yellow tile.